Guy Mendes, Jonathan Williams and Okra the VW, Highlands, NC, 1986, gelatin silver print. Courtesy of the artist and Institute 193. © Guy Mendes. The influence of the art market is everywhere. As of 2019, there are few places on Earth where an artist can make work unaware of its potential commercial value. But in the 1980s and 90’s– the last decade before the internet’s emergence–one could still escape along the backroads into the American South to find a wild country zone filled with eccentric people, many of whom made art. Upon discovery, their accumulated works revealed untouched Edens of personal creativity. This context is beautifully idealized in the exhibition Way Out There: The Art of Southern Backroads now on view at the High Museum. The show tells the story of three trained artists, Roger Manley, Guy Mendes, and Jonathan Williams who traversed a flourishing rural art scene on a quest to make a guidebook, “Walks to the Paradise Garden.” Presented in an inventive mix of classic works from the museum’s Folk and Self-Taught art collection, alongside documentary photographs and bold graphics of found poetry, the exhibition design reconstructs a certain spirit of the original manuscript of their travels. Folk art can often feel sanitized in a professional gallery setting; however, this show encourages viewers to imagine the weird and magical environments from which it was originally extracted. The impetus for the guidebook, “Walks to the Paradise Garden,” on which this exhibition is based, was inspired by “Blue Highways,” a bestselling travelogue from 1982 by William Least Heat-Moon. The title refers to the unofficial roads marked in blue in the old-style Rand McNally Atlas. It successfully appealed to a mainstream audience and described the charming yet underappreciated culture of the American countryside. “Landsakes and tarnation, this is a book I should have written,” exclaims Williams jokingly in the preamble. This led him to talk to documentary photographers Guy Mendes and Roger Manley “about pooling our talents and adding dazzling stops along the way of Least Heat-Moon’s journey.” Although Williams’ manuscript was completed in 1992, the guidebook was finally published this year (over a decade after Jonathan Williams passed away) by Institute 193 of Lexington, Kentucky. It’s founder, Philip March Jones, is a co-curator of the exhibition, along with the High’s in-house curators Katherine Jentleson and Gregory Harris. Roger Manley, Clyde Jones, Haw River Crossing, Bynum, NC, 1988–89, pigmented inkjet print. Courtesy of the artist and Institute 193. © Roger Manley. If the museum’s formal context domesticates the art on view, the book contains much of the original wildness of the self-taught artists, photographers, and poet alike. Williams writes in a raucous free-form language alongside documentary photographs by Roger Manley and Guy Mendes. Like many southerners, all three appear to share a healthy distaste for the dominance of a high brow, city-centered art world and have identified with being on the outside of that sphere. They were progressive to value the undomesticated creative genius that proliferated in the hinterlands of their home zone and all shared a prescient desire for its preservation. The exhibition is so elegantly designed, but only briefly addresses a few complications: embedded in this story are important issues of race, economics, and power. A video at the entry addresses this briefly by quoting Williams. In hip colors and quick clever edits, it serves as a cute and yet courageous disclaimer for the entire show, claiming light-heartedly, “Okra eaters and non-okra eaters alike, don’t fret.” The video goes on to acknowledge that three southern white men made the guidebook, around which the entire show is structured. An accented voice implores the audience that the exhibition is notanthropology, nor is the book kitsch for the coffee table. In a time of contentious identity politics within the art establishment itself, the history of folk art’s discovery is somewhat fraught. It would be disingenuous to sweep this under the rug entirely. But by treating it with humor, the curators cast those issues easily aside and plunge directly into the fun. Installation view, Way Out There: The Art of the Southern Backroads, Courtesy High Museum of Art. Photo by Mike Jensen. Installation view, Way Out There: The Art of the Southern Backroads. Courtesy High Museum of Art. Photo by Mike Jensen. The self-taught celebrities are dutifully represented: Howard Finster, St. EOM from the Land of Pasaquan, Thornton Dial, and Lonnie Holley, but lesser known artists and anonymous found art are also present. The artists are diverse in age, race, gender, and geography, emphasizing a diversity in the rural scene that undercuts perceptions of the South’s backwards rural politic. Many lesser-known women artists of the South like Mary T. Smith, Georgia Blizzard, Minnie Links Black, and Sister Gertrude Morgan are given some real estate along with their more well-known male counterparts. Guy Mendes, Minnie Lincks Black with her Whale Harmonica, East Bernstadt, KY, 1984, pigmented inkjet print. Courtesy of the artist and Institute 193. © Guy Mendes. Southern self-taught art is nothing if not maximalist. The consistent horror vacui of self-taught artists is managed within many traditionally framed photographs of insanely packed art yards. Clyde Jones’ backyard army of animals made out of logs is an excellent example of an artist-initiated gallery unfurling outdoors. Manley tames what looks like hundreds of artworks into a single photograph. The book refers to this as a “yard show,” a fitting term for backroad galleries the travelers documented. Roger Manley, J.B. Murray, Glascock County, Georgia, 1987. © Roger Manley. Courtesy High Museum of Art. The work in Way Out There: The Art of Southern Backroads, and the interesting avant garde who brought it to the public’s attention, reveals a critical time capsule which will continue to be unpacked for decades. Most inspiring is how artists worked without much intention for commercial success. Reading through the book, many interviews reveal artists who are under-employed or retired. Unlike their urban counterparts they had ample time and space, and many used their art to work through boredom or personal psychological issues. This reflects a raw and honest humanity, while expressing convoluted and complicated politics unconsciously. This is where the analogy of many paradises feels most apt. A religious word for utopia, paradise is that idyllic garden, a blissful state before awareness. Like dreamy children, these artists are frozen in time, both free from and vulnerable to the savvy art world beyond. The exhibition successfully makes a case for understanding southern self-taught art within a universal rural identity. 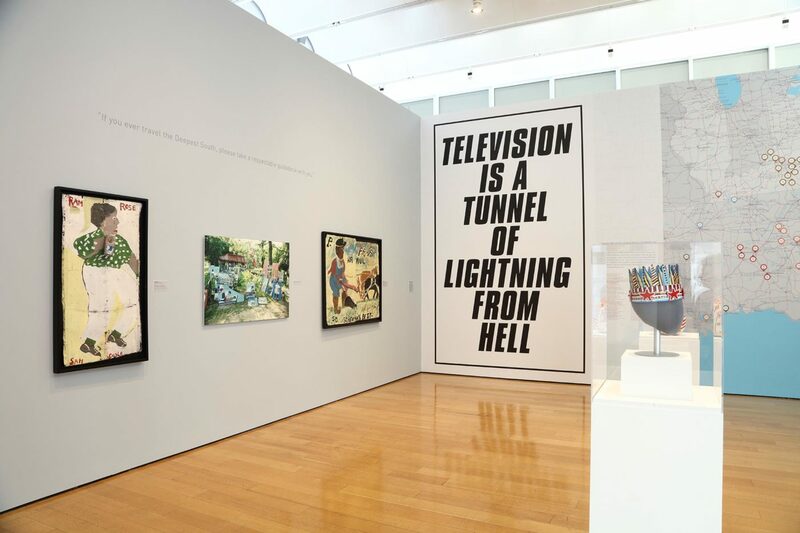 And with this message, the exhibition avoids some ugly southern baggage, opting instead for folk art’s radical accessibility for a mainstream audience. It also serves to further validate the genre to an international market hungry to consume. Way Out There: The Art of Southern Backroads is on view at the High Museum of Art through May 19, 2019. Walks to the Paradise Garden is now available for purchase through Institute 193.